Members of the Order of the Eastern Star are aged 18 and older; men must be Master Masons and women must have specific relationships with Masons. Originally, a woman would have to be the daughter, widow, wife, sister, or mother of a Master Mason, but the Order now allows other relatives as well as allowing Job's Daughters, Rainbow Girls, Members of the Organization of Triangles (NY only) and members of the Constellation of Junior Stars (NY only) to become members when of age. 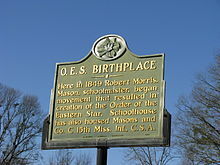 The Order was created by Rob Morris in 1850 when he was teaching at the Eureka Masonic College in Richland, Mississippi. While confined by illness, he set down the principles of the order in his Rosary of the Eastern Star. By 1855, he had organized a "Supreme Constellation" in New York, which chartered chapters throughout the United States. In 1866, Dr. Morris started working with Robert Macoy, and handed the Order over to him while Morris was traveling in the Holy Land. Macoy organized the current system of Chapters, and modified Dr. Morris' Rosary into a Ritual. On December 1, 1874, Queen Esther Chapter No. 1 became the first Prince Hall Affiliate chapter of the Order of the Eastern Star when it was established in Washington, D.C. by Thornton Andrew Jackson. The "General Grand Chapter" was formed in Indianapolis, Indiana on November 6, 1876. Committees formed at that time created the Ritual of the Order of the Eastern Star in more or less its current form. Adah (Jephthah's daughter, from the Book of Judges). In Eastern Star, Adah is represented by the color blue and a sword and veil. Adah represents the virtue of obedience to duty. Ruth, the widow from the Book of Ruth. In Eastern Star, Ruth is represented by the color yellow and a sheaf of barley. Ruth represents the virtue of religious principles. Esther, the wife from the Book of Esther. In Eastern Star, Esther is represented by the color white and a crown and scepter. Esther represents the virtue of loyalty. Martha, sister of Mary and Lazarus, from the Gospel of Luke and the Gospel of John. In Eastern Star, Martha is represented by the color green and a broken column. Martha represents the virtue of endurance in trial. Electa (the "elect lady" from II John), the mother. In Eastern Star, Electa is represented by the color red and a chalice. Electa represents the virtue of endurance of persecution. Officers representing the heroines of the order sit around the altar in the center of the chapter room. Conductress – Leads visitors and initiations. Associate Conductress – Prepares candidates for initiation, assists the conductress with introductions and handles the ballot box. Warder – Sits next to the door inside the meeting room, to make sure those that enter the chapter room are members of the Order. Sentinel – Sits next to the door outside the chapter room, to ensure people who wish to enter are members of the Order. Traditionally, a woman who is elected Associate Conductress will be elected to Conductress the following year, then the next year Associate Matron, and the next year Worthy Matron. A man elected Associate Patron will usually be elected Worthy Patron the following year. Usually the woman who is elected to become Associate Matron will let it be known who she wishes to be her Associate Patron, so the next year they will both go to the East together as Worthy Matron and Worthy Patron. There is no male counterpart to the Conductress and Associate Conductress. Only women are allowed to be Matrons, Conductresses, and the Star Points (Adah, Ruth, etc.) and only men can be Patrons. Once a member has served a term as Worthy Matron or Worthy Patron, they may use the post-nominal letters, PM or PP respectively. The International Temple in Washington, D.C. The General Grand Chapter headquarters, the International Temple, is located in the Dupont Circle neighborhood of Washington, D.C., in the Perry Belmont Mansion. The mansion was built in 1909 for the purpose of entertaining the guests of Perry Belmont. They included Britain's Prince of Wales in 1919. General Grand Chapter purchased the building in 1935. The secretary of General Grand Chapter lives there while serving his or her term of office. The mansion features works of art from around the world, most of which were given as gifts from various international Eastern Star chapters. The Order has a charitable foundation and from 1986-2001 contributed $513,147 to Alzheimer's disease research, juvenile diabetes research, and juvenile asthma research. It also provides bursaries to students of theology and religious music, as well as other scholarships that differ by jurisdiction. In 2000 over $83,000 was donated. Many jurisdictions support a Masonic and/or Eastern Star retirement center or nursing home for older members; some homes are also open to the public. The Elizabeth Bentley OES Scholarship Fund was started in 1947. ^ "Installation Ceremony". Ritual of the Order of the Eastern Star. Washington, DC: General Grand Chapter, Order of the Eastern Star. 1995 . pp. 120–121. ^ Ayers, Jessie Mae (1992). "Origin and History of the Adoptive Rite Among Black Women". Prince Hall Masonic Directory. Conference of Grand Masters, Prince Hall Masons. Retrieved 2007-10-25. ^ "Rob Morris". Grand Chapter of California. Archived from the original on 2007-09-28. Retrieved 2007-10-01. ^ a b c d e f "Eastern Star". Symbol Dictionary: A Visual Glossary. 26 Jan 2018. ^ "OES Charities". Retrieved 2016-04-15. ^ "Elizabeth Bentley Order Of The Eastern Star Scholarship Award". Yukon, Canada. Archived from the original on 2009-05-05. Retrieved 2009-11-05. ^ a b c d e f g h i j k l m n o p q r s t u v w x y z Binheim, Max; Elvin, Charles A (1928). Women of the West; a series of biographical sketches of living eminent women in the eleven western states of the United States of America. Retrieved 8 August 2017. This article incorporates text from this source, which is in the public domain. ^ District of Columbia Daughters of the American Revolution (DCDAR) Memory Book Volume IV. Washington, DC: District of Columbia Daughters of the American Revolution (DCDAR). 1958. p. 92. ^ Who's who in New York City and State. L.R. Hamersly Company. 1914. pp. 81–. ^ "History of Chapter Reviewed on 75th Anniversary - 31 Jul 1955, Sun • Page 19". Medford Mail Tribune: 19. 1955. Retrieved 23 September 2017. ^ Willard, Frances Elizabeth; Livermore, Mary Ashton Rice (1893). A Woman of the Century: Fourteen Hundred-seventy Biographical Sketches Accompanied by Portraits of Leading American Women in All Walks of Life (Public domain ed.). Moulton. pp. 277–. ^ Merritt, Frank Clinton. History of Alameda County, California. Retrieved 24 September 2017. This article incorporates text from this source, which is in the public domain. ^ "Kate Hamilton Pier is laid to rest on wedding day; many pay tribute". Eagle River News: 4-5. 1925. Retrieved 15 September 2017. ^ Mackey, Albert G. (2013). Encyclopedia Of Freemasonry (Annotated Edition). Jazzybee Verlag. ISBN 9783849631567. Retrieved 3 October 2017. ^ "James P. Smith". The Bernice Banner, Bernice, Louisiana. Archived from the original on 2015-02-24. Retrieved September 13, 2013. ^ "Thomas, Lee Emmett". Louisiana Historical Association, A Directory of Louisiana Biography (lahistory.org). Archived from the original on September 23, 2010. Retrieved December 29, 2010.